Are you one of those people who can't help but respond to a beat? Do your hips begin to shimmy to good music even if you're trying to hold a conversation? If you've convinced even the shyest wallflower to take a turn around the dancefloor, you'll need a costume that will honor that service. It takes courage to be the first one stomping and swaying to live music. And what would the world be like without dancers? They're people we take for granted. They feed so much energy to the musicians and the crowd. Without them, there would be fewer stories to tell and nights listening to music would be cut short. 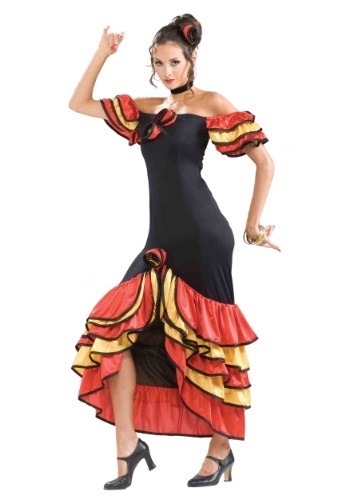 So it's kind of a mystery to us why this Spanish dancer costume isn't filed under the superhero section. Are you ready to let loose to the music? You'll love the way this fitted, off-shoulder dress makes you feel. This lovely style has ruffled sleeves and roses down the middle of the top. A ruffled, layered hem makes dance moves extra dramatic, moving with your movements. The whole ensemble is topped off with a rose the fixes to your hair with a comb.,m letting you move all you want without worrying about your style coming undone. When the music gets started, there are three kinds of people. There are those that slink away to talk to friends and study the refreshments table. There are those who bob on the sidelines of the crowd, carefully not stepping onto the dancefloor. Then there's the type of person who starts the dancing so confidently that the crowd around can't help but join them. And if you're the kind of person that knows how to find the beat on a dime, you'll love this colorful look!